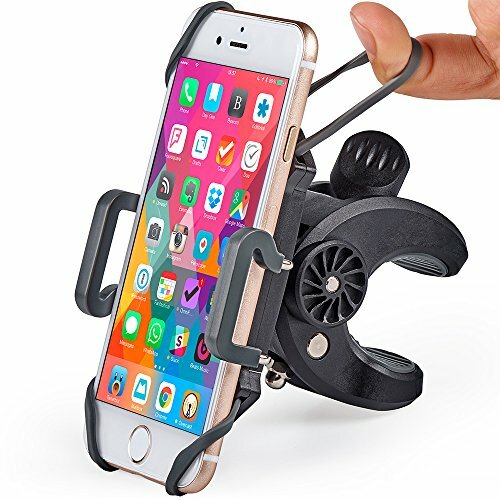 If you spend more than an hour driving your motorcycle every day, you need to have a mobile phone mount. Using your phone while driving – whether you have to answer a call, check your navigation or play music – can be safely done when you have attached it to a good mount. Take into consideration, it can be inconvenient and dangerous to fumble around looking for your phone while you are on the road. Eliminates distractions. Remember that you have to keep your eyes on the road at all times. Helps you see the screen well when navigating or waiting for important updates. Have your phone within close proximity so you can see your screen when following a map or reading important notifications and text messages. No more falling phones. Phones typically slide off one’s pocket when driving. Keep it firmly secured by mounting it in front of you. Distraction-free driving with a smartphone boils down to choosing the right mount. We have collated all the best motorcycle cellphone mounts that you can buy online. These are sturdy and affordable, and can help you use your mobile devices while on the road. 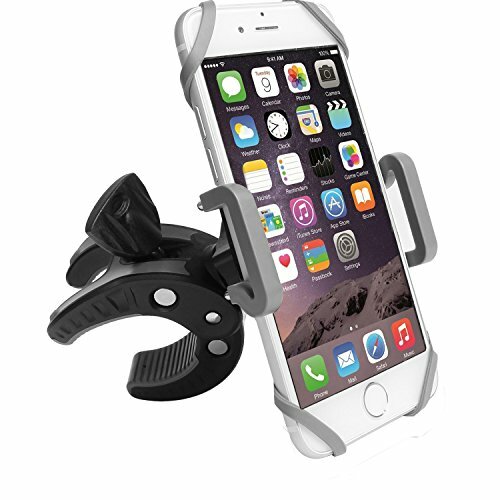 Keep your hands on the handlebar by using this universal Bike & Motorcycle phone mount. It can hold multiple brands of cell phones, including the latest releases such as the iPhone XS and Samsung Galaxy S9. With it, you will get complete unrestricted touch access so you don’t have to unmount it when you have to reply to a text message or answer a call. It also has a rubberized clip with silicone belts that grip mobile devices firmly even when swerving, braking and accelerating. Easily access your most-used mobile applications when traveling by using the Dogo Cruiser. It is known for its secure grip technology that was tested to endure up to 150mph speed, guaranteeing you that your phone is robustly clamped on your handlebar even when you have to drive fast. It also has silicone spacer rings that help cut down on handlebar vibration so it won’t hinder your control. The phone mount can also be tilted 360 degrees to match your angle preferences or for portrait and landscape viewing. To top it all off, they offer a lifetime and a money-back guarantee in case you are not happy with your purchase. This motorcycle phone mount from PTUNA extends up to 3.7 inches to hold any smartphone that you own. It’s easy to install – you don’t need a special tool to fit it on your handlebar. The anti-slide silicone lining on the clamp does not just keep your phone in place, it also ensures that you won’t damage the outer protection of your handlebar. Additionally, the 360 degrees rotation allows you to find the right angle that lets you see your phone screen well. 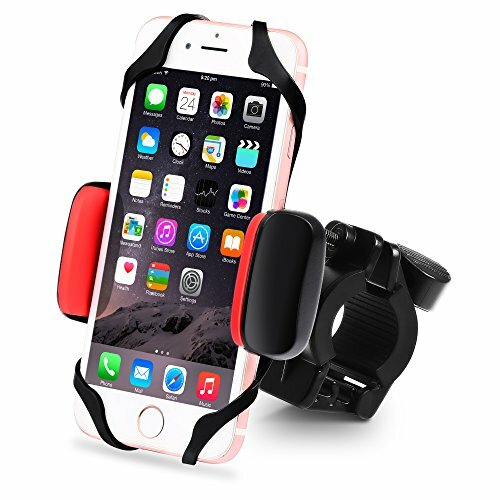 There are also 4 safety rubber belts for the edges of your phone that serve as added protection, so your mobile phone does not slide off the holder even if you have to drive on steep hills and rocky roads. These also make mounting and un-mounting exceptionally easy. Lastly, to ensure customer satisfaction, they do offer a 1-year warranty and a lifetime technical support. If you are on a lookout for a stylish motorcycle phone holder yet very affordable, Ailun is such a good option. It can be used on whatever handlebar, whether you own a universal-sized or something bigger from Harley-Davidson. No need for tools because the convenient one-screw system helps you install it simpler and quicker. The silicone bands come in two colors – red and black – which you can change depending on your style and mood, or can serve as a back-up once the other one is already loose. The grip is detachable and adjustable so it can fit it any smartphone sizes. You can also rotate it up to 360 degrees for better angle viewing. 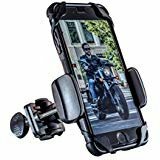 The sturdiest among the list – Yoassi Metal Bike & Motorcycle Cell Phone Mount – is known for its high versatility and compatibility with most of the mobile phones. It is made of zinc alloy, with a corrosion-resistant barrier. Because of the materials used, the brand made a bold promise that it “won’t break ever!” They also use the biggest clamp in the market which increases its stability. The metal stems and newly improved design has thick silicone shock-absorbing padding that snugly hold your phone, even during bumpy rides. For added protection, the package also includes two silicone bands that are used to tightly catch the edges to ensure your phone never slips out accidentally, without obstructing usage at all. The brand also strengthened their customer satisfaction through their 24-hour refund and replacement guarantee. 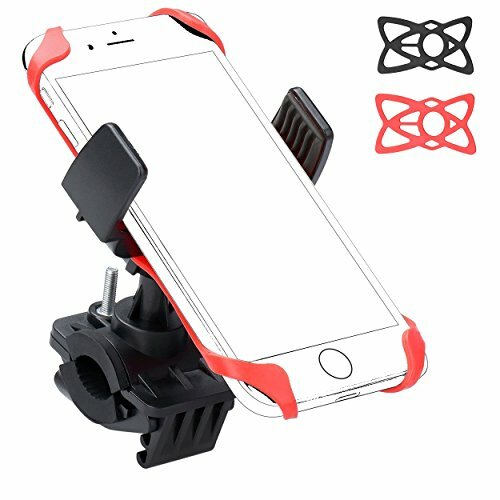 When choosing the best motorcycle phone mount, you have to consider the area where you can attach it. Ideally, it should not block your view when driving. You should also stay away from those with suction as these lose their grip during extreme weather conditions. Also consider the size of the main holder and ensure that it can securely grip your handlebar. A money-back and return warranty could be considered, too, so in case it doesn’t match the size of your handlebar, you can give it back and have it replaced or refunded. We hope that we have helped you find the best motorcycle phone mounts in the market today.